Cosimo is using Smore newsletters to spread the word online. The world's first nuclear explosion was achieved with plutonium, a man-made element produced in nuclear reactors. Plutonium is created when an atom of uranium-238 absorbs a neutron and becomes plutonium-239. The reactor generates the neutrons in a controlled chain reaction. For the neutrons to be absorbed by the uranium their speed must be slowed by passing them through a substance known as a "moderator." Graphite and heavy water have been used as moderators in reactors fueled by natural uranium.Heavy water looks and tastes like ordinary water but contains atoms of deuterium instead of atoms of hydrogen. For heavy water to succeed as a moderator, it too must be pure; it must be free of significant contamination by ordinary water, with which it is mixed in nature. Brigadier-General Leslie R. Groves, himself an engineer, was now in complete charge of a project to assemble the greatest minds in science and discover how to harness the power of the atom as a means of bringing the war to a decisive end. The Manhattan Project (so-called because of where the research began) would wind its way through many locations during the early period of theoretical exploration, most importantly, the University of Chicago, where Enrico Fermi successfully set off the first fission chain reaction. But the Project took final form in the desert of New Mexico, where, in 1943, Robert J. Oppenheimer began directing Project Y at a laboratory at Los Alamo's, along with such minds as Hans Bethe, Edward Teller, and Fermi. 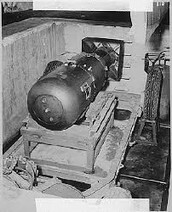 Here theory and practice came together, as the problems of achieving critical mass—a nuclear explosion—and the construction of a deliverable bomb were worked out.Finally, on the morning of July 16,in the New Mexico desert120 miles south of Santa Fe, the first atomic bomb was detonated. 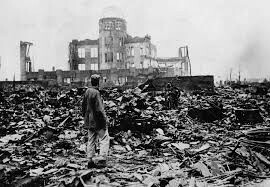 The scientists and a few dignitaries had removed themselves 10,000 yards away to observe as the first mushroom cloud of searing light stretched 40,000 feet into the air and generated the destructive power of 15,000 to 20,000 tons of TNT. The tower on which the bomb sat when detonated was vaporized. Nuclear explosions produce both immediate and delayed destructive effects. 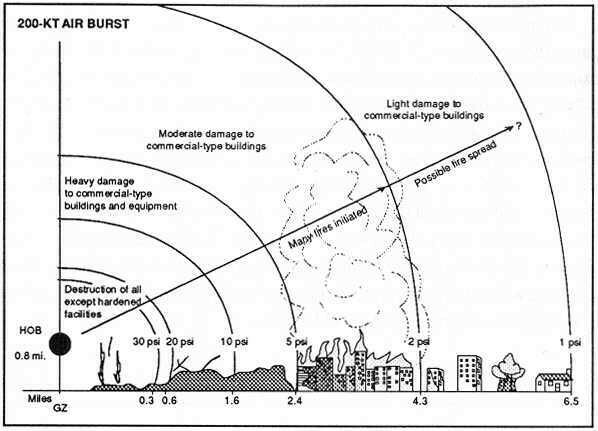 Blast, thermal radiation, and prompt ionizing radiation cause significant destruction within seconds or minutes of a nuclear detonation. The delayed effects, such as radioactive fallout and other possible environmental effects, inflict damage over an extended period ranging from hours to years. Each of these effects are calculated from the point of detonation. When a nuclear weapon is detonated on or near Earth's surface, the blast digs out a large crater. Some of the material that used in be in the crater is deposited on the rim of the crater; the rest is carried up into the air and returns to Earth as radioactive fallout. An explosion that is farther above the Earth's surface than the radius of the fireball does not dig a crater and produces negligible immediate fallout. For the most part, a nuclear blast kills people by indirect means rather than by direct pressure. 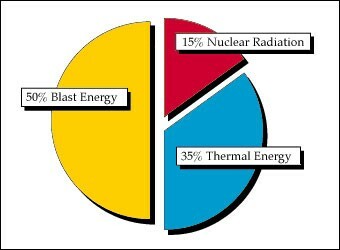 Approximately 35 percent of the energy from a nuclear explosion is an intense burst of thermal radiation. The effects are similar to the effect of a two-second flash from an enormous sunlamp. Since the thermal radiation travels at roughly the speed of light, the flash of light and heat precedes the blast wave by several seconds, just as lightning is seen before thunder is heard.The visible light will produce "flashblindness" in people who are looking in the direction of the explosion.If the flash is focused through the lens of the eye, a permanent retinal burn will result. Skin burns result from higher intensities of light, and therefore take place closer to the point of explosion. First-degree, second-degree and third-degree burns can occur at distances of five miles away from the blast or more. Third-degree burns over 24 percent of the body, or second-degree burns over 30 percent of the body, will result in serious shock, and will probably prove fatal unless prompt, specialized medical care is available. The entire United States has facilities to treat 1,000 or 2,000 severe burn cases. 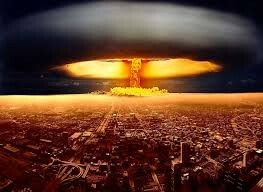 A single nuclear weapon could produce more than 10,000.The thermal radiation from a nuclear explosion can directly ignite kindling materials. In general, ignitable materials outside the house, such as leaves or newspapers, are not surrounded by enough combustible material to generate a self-sustaining fire. Fires more likely to spread are those caused by thermal radiation passing through windows to ignite beds and overstuffed furniture inside houses. Hair-trigger alert is a risky policy to inherit. From faulty computer chips to misinterpreted radar signals, human and technical mistakes have caused dozens of safety failures and close calls. An accidental or unauthorized missile launch could kill millions of people—and trigger a Russian launch that could kill many millions more.Taking U.S. weapons off hair-trigger alert would immediately remove this risk. It would increase the safety of all Americans while maintaining a strong and credible U.S. defense. It would also encourage Russia to take its missiles off hair-trigger alert. Hair-trigger alert is a U.S. military policy that enables the rapid launch of nuclear weapons. Missiles on hair-trigger alert are maintained in a ready-for-launch status, and can be airborne in a matter of minutes.